Pikaia! is awesome. 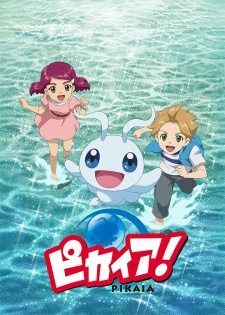 It's an educational anime about children time-travelling back to the Cambrian era and meeting all the prehistoric creatures that lived back then. They're doing this because the Earth's become uninhabitable in their era, but mankind would like to recover the "lost codes" (i.e. DNA) that might let life regenerate. Oh, and each episode contains 11 minutes of fiction, followed by a four-minute science lecture. That was Season 1. Pikaia!! (with two exclamation marks) is basically the same, but without the "Cambrian" bit. We see a much broader range of prehistory and the Morris Lectures at the end are sometimes about ordinary lifeforms that are still alive today and current science. I mourn the fuzzier focus, but it's still a fun, educational show that taught me a lot. I approve of it. Firstly, the science. I felt I got a better overview here than I did in Season 1. The Cambrian era's funky because that's when life on Earth went from being tiny blobs (mostly unicellular) to being proper multicellular creatures that could swim around, hunt each other, leave fossils and so on. In other words, those were the first drafts at life on Earth. It shouldn't be surprising that some of them looked wacky. In this season, though, we visit different eras. We never see dinosaurs, mind you. It's all Paleozoic, not Mesozoic or later. However I think we visit all the Paleozoic eras, for instance seeing Dunkleosteus (scary 10m long armoured fish), Dimetrodon (that reptile with a sail on its back that looks like a dinosaur but isn't), a frog-crocodile that frog-piles you, a monster millipede, etc. Something modern that the show's also keen on, though, is biometics. (That's what they were saying in Japanese, anyway, but I don't know if that's an English word too.) What it meant here was modern technology learning from nature. We see how barnacles can outdo all modern glues, how an artificial dragonfly got built in Germany and how that could lead to more efficient wind power generation. We see the awesomeness of grasshoppers. This is all great. It also lets the main show build its plot around big science concepts that are then explained and made even cooler in the Morris Lectures. Have you heard of the Snowball Earth hypothesis, for instance? I hadn't, but I have now. My only criticism is with the show's approach to extinction events, i.e. times when most of the world's species died out. (The one that killed the dinosaurs is only the most recent.) The show talks about the Big Five, which is good and approximately accurate in real-world terms, but I think it's wrong within the fiction. This year's baddie is trying to bring about the sixth. This is questionable even right now, since mankind is causing the sixth one as we speak. It's known as the Holocene extinction. However it's a thousand times goofier according to this show's SF future history, in which the Earth has become uninhabitable. If that's not already a Sixth Extinction, I don't know what is. What would it mean to trigger a mass extinction in a world that's already dead? The baddie's plan is moderately thought-provoking and fits beautifully into the show's themes, but I also think it founders on the show's worldbuilding. As for the plot and characters, our heroes are doing the same as before. However there's now a third member in their party, which doesn't please Hana because their new friend was a villain in Season 1. This year's villain takes a while to step out of the shadows and unfurl his plan for... interestingly, he's not motivated by evil. He's got the same environmental desire to save the planet as everyone else. It's just that he's taken his logic a bit further, that's all. It's a fun show. It's surprisingly entertaining for an educational children's show with 14-year-old heroes. The tension among our three heroes works, the baddie's plan is as extreme as it gets and the science and prehistory was of course catnip for me. I love Pikaia.